There are these movies that you watch; and the first thing that you want to do after watching is to tell people about the experience that they were, the feelings they brought out and much more...But then you just can't think of the right adjectives that would aptly describe the same. Punjab 1984 is one such movie. Today as I write this review, I really hope that my limited vocabulary does not cripple me as I try and communicate the beauty of the the movie that touched my heart and left me numb for a long time. Numb not only because of the sentiments of grief and hopelessness depicted in this movie but also because of the way that they were marvelously portrayed by the actors in the movie. So before I proceed, let me add a disclaimer - no words whatsoever can describe the soul of the movie Punjab 1984. I write this review from the heart so excuse me for throwing aside the Critics Hat and not covering all the elements that go into the making of a movie. I will only talk about what left a lasting impression on me. Let me start with the acting then...All the actors in this movie played their part wonderfully well; I will however, mention the ones that come to my mind as I close my eyes thinking about the movie. And those actors are...Kirron Kher and Pavan Malhotra. 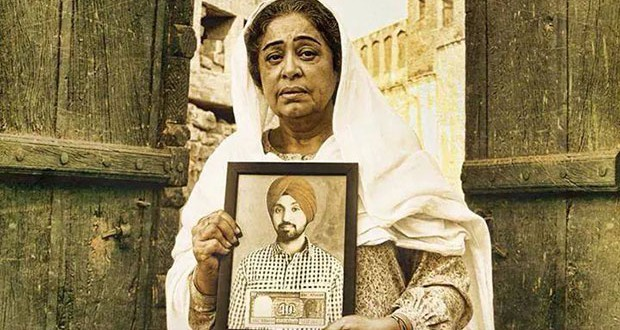 The movie set in the background of the 1984 riots in Punjab and the anarchy that followed, is a story of the longing and misery of a mother whose son has been wrongly convicted as a terrorist. And what a mother Kirron Kher has played!! She makes you feel the agony...You will actually feel the heaviness in your heart all through the movie as you experience those sentiments. We have seen Kirron as a mother in several Bollywood movies off late and loved her acting in all of those. But none of those roles bring out her true potential as an actor like Punjab 1984 does. Legendary to say the least. As I watched the movie, I pledged to watch all of Kirron Kher's upcoming movies only to salute the artist in her. Now about Pavan Malhotra who played the cruel cop in the movie. He managed to truly highlight the importance of supporting roles in movies. The roles that can significantly impact the audiences' perception and feelings about the characters and actors in lead roles. Had Pavan not given his best to the role of a cruel cop, Kirron's character in the movie would have taken a hit - the viewers would have not been able to sympathize as much with the mother she plays. Not giving too many details about the story I would now urge anyone who understands Punjabi even a bit to watch this movie so as to experience what cinema without glamour means and to believe that acting and direction skills can create masterpieces without any other superficial support. For those who don't understand Punjabi, it is a pity that language barrier might prevent you from experiencing to the fullest one of masterpieces of Indian Cinema. I am nevertheless sharing with you the link to the movie with English subtitles. Even though I am sure that literal translations would not do any justice to the hard work of the script writer, its better that than missing the experience completely.